Please help me with this block and off se the triangles. Thread: Please help me with this block and off se the triangles. They are offset a little too much. On the top photo, the top tan piece should be scooted over a little to the right. Your stitching line should end up right where the two triangle pieces meet. You shouldn't see any blue below the stitching on the right side. I wish I could just "show" you! the first picture, measure a 1/4" from the point on the bottom blue piece,(closest to your seam ripper), marking in from right to left. Align the top tan triangle to match the mark, just the way it looks, and then pin carefully, middle, right, left. Another way would be to cut off the 1/4"tail on the blue piece, and line the tan piece up with the cut. I hope this makes sense. Did you starch the fabric before cutting the triangles? Looks to me as if you may also be getting stretching along the bias sides of the long triangles (especially noticeable on bottom right of middle photo). What order are you putting this block together in? I think there's an easier order than what you're doing. Ok Thanks will try not of setting them so much. Scissor Queen.. I am making the blue triangles with 3 pieces then the lower blue pieces and then doing the same with the other colors. Then sewing them all together. Clear as mud? That's what I thought you were doing. The easier way to do that block is to make the center four patch first. 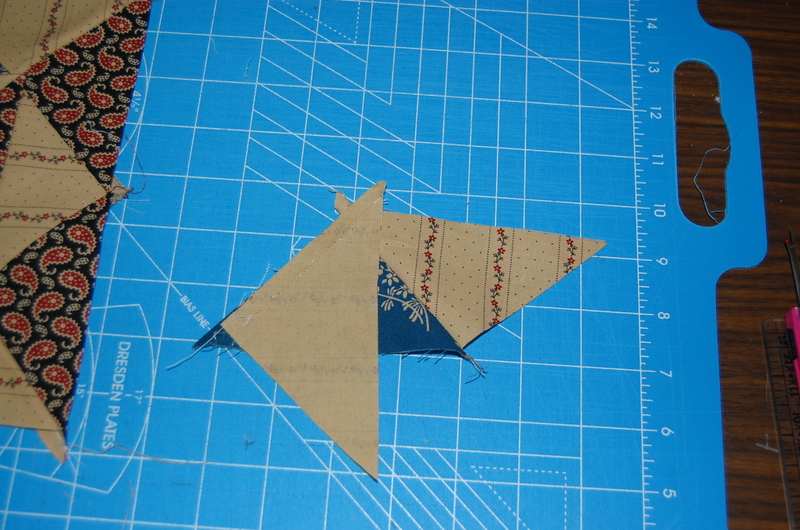 Then the sew the two triangles together that make the corner units and add them. Then add the larger triangles to each side. 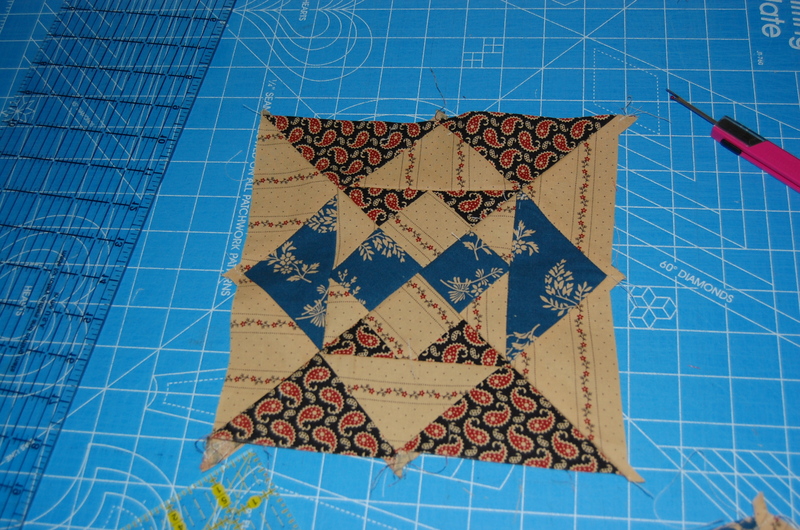 Sew the two larger triangles together that make the last corners and add them. You never have to sew offset triangles that way. You match the bottom straight edges. Starch it all to almost paper before you cut. Scissor Queen I see what you mean, unfortunately I already cut my triangles. It is a block of the month and I am 2 months behind was trying to get it done before my next meeting. ( which was last night) I made the 1 st block saw that is was wonky so did not sew anymore. Now I am trying to make the next 7 so I can do the next 2 months of blocks. I am determined to catch up. Want the free batting at the end of the year. I would do an old thing and draw a 1/4 inch line this will show you exactly where to fit triangles. It also looks as if you have a little stretch on the bias. Do you have some more fabric to cut inside triangE. .
, +, Your beginning 4 patch needs to be meeting at the center seam seams and squared. You need to square every time you add something. I will be a beautiful block. Draw your 1/4 inch seam lines along all sides at the tips. This will give you the intersection points where your seams should meet. Put a pin through the intersection on both the blue and tan pieces. This way they will be lined up where they should be. I would take it apart and put it together the other way. I'll come out lots straighter. I agree with scissor queen....just straight edge sewing! Maybe this graphic will show you the offset that may be causing your problem. Notice carefully the seam lines indicated by the red (for wrong) and green (for best way) arrows. I found it very helpful to have the corner seam points marked so I could match them up. 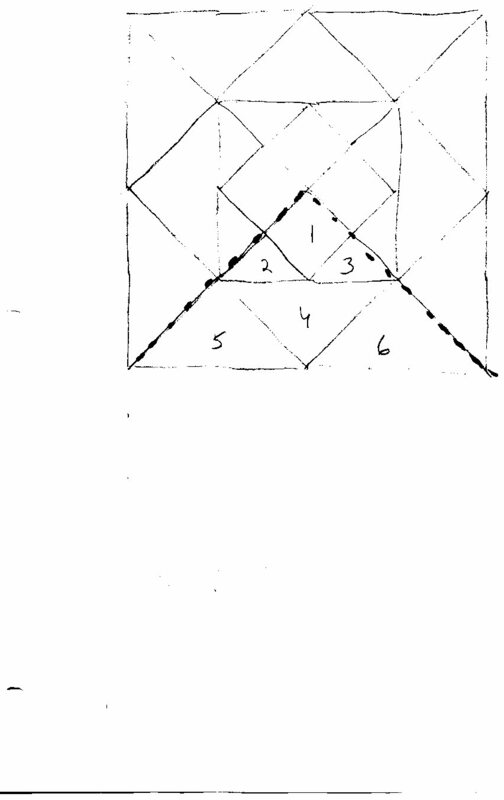 I think I would construct the block into four triangle units, and then put the the triangle units together. I think that's the way she's putting it together and it's coming out wonky. The easiest is to put the four patch together. Then sew the two triangles together that go on the sides of the four patch (#3 and the unmarked one to the right) and add them. Then add all of the #4 triangles. Then sew the #6 to the unmarked one to the right and add that unit to the square. There are no off sets to sew that way. One of the first things you need to do is starch your fabric. Starch it before you cut it out. Starch it stiff. It help with keeping bias from stretching and raveling. I would never attempt that block without starching first. I use Sta-Flo from Walmart mixed half with water. A lot of good advice here from Scissor Queen. But perhaps you are not "seeing" the four patch in the center on point. If you start there, as suggested, I think it would be easier. Also, Jan's graphics on matching ends of seams is good. The seam goes exactly where the two triangle pieces cross each other. where are you going with the blocks? a class? someone should be able to help you with your blocks. ask questions. and you might start stitching with a scrap of fabric (leaders and enders) so your triangle points don't want to go down into the feed dogs so much. Good luck. Since you have already cut your pieces, you will know to starch next time. Smiles. I do have to agree with SQ, your best bet is to construct your block from the 4patch out, eliminating the need to even make those difficult pieces you are having so much trouble with. Each time you are making the square larger by adding triangles to the straight edges. This gives you a bigger square with straight edges to work with for the next step, which is adding larger triangles. 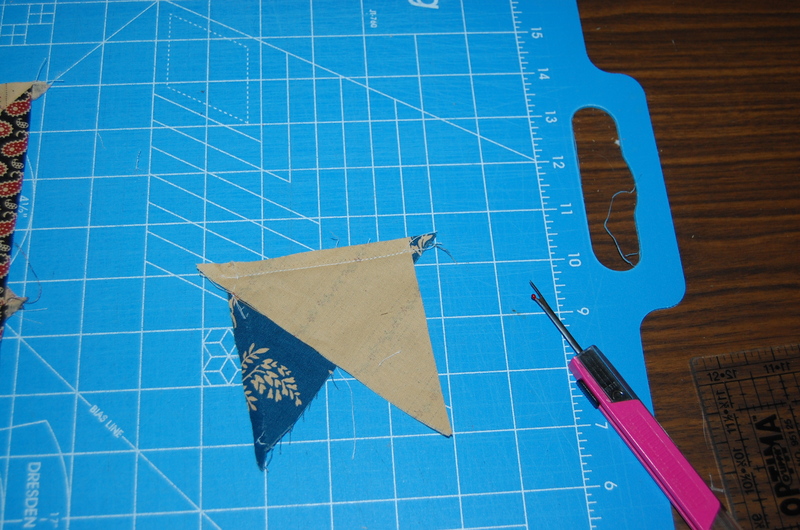 The trickiest thing you have to do is sew two triangles together to make the larger triangle on some sections. Try it this way just once and you will have your 7 blocks done in not time at all. 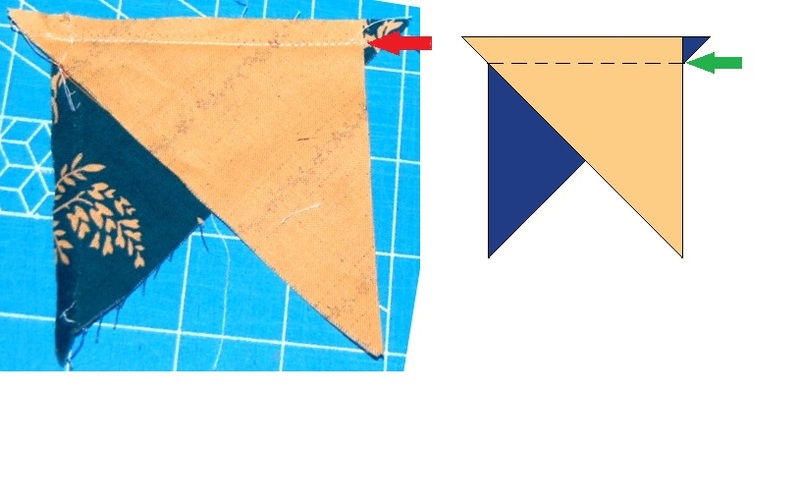 on each triangle, draw a pencil line on the wrong side (the side you are going to sew on)...draw it 1/4" in from the edges..all the way to the end of each side...�you will have a "v" at the sharp ends where the overlap will be, and a "square" at the 90 degree end (bottom left in the lower pic). The lines forming the "Square" a the 90 degree end will tell you where your overlap should be. The lines will meet at that corner and you will have a 1/4" lip/tag sticking out. See where your 1/4" stitches are? That is where the lip/tag should start to stick out. You start your stitching at the inside of the "v" that forms. When you cut the triangle points off before you sew, you then have a perfect flat end to line up with the side of the opposing triangle. No guesswork, and for my money, easier than drawing a line on every triangle. After a while, you will get used to eyeballing where to line them up. I know I did.